As many as 28 state governments have signed MoUs with the NHA to implement NHPM. Over 8,000 hospitals have offered to join the network of empanelled facilities that would provide inpatient care to the identified beneficiaries, and 1,350 medical packages—covering surgery, medical and daycare treatments—have already been identified. Nearly 3,000 years ago, one of ancient India’s great sages Yajnavalkya composed the Shanti Sukta: “Sarve bhavantu sukhinah; Sarve santu niramayah” (May all be happy, may everyone be free of diseases). What is striking is not only the prescience and universality of this invocation, but also the insight that happiness and health in a populace are inextricably intertwined. Today, as we reflect upon the journey of India as an independent nation over the last seven decades, the achievements on the health front have not been insubstantial. The life expectancy has more than doubled, and infant and maternal mortality rates are a fraction of what prevailed in 1947. However, there can be no denying the fact that a lot of potential in this sector remains unharnessed—and ill-health is one of the leading causes of Indians falling into poverty. The government spends barely 1% of the GDP on health even as we are confronted with a two-front war—containing the rising burden of non-communicable diseases (NCD), even as we continue grappling with the control of communicable diseases and reproductive and child health issues. As a result, the citizens’ out-of-pocket (OOP) expenditure on health constitutes 62% of the total expenditure on health, placing India at 182nd position out of 191 countries on this indicator. In fact, over 55% of this expenditure is on outpatient care, of which drugs constitute the biggest component. Expectedly, this structure of health financing places a disproportionate burden on the poor families and catastrophic health expenses have contributed to an increase in poverty levels in rural and urban areas by 3.6% and 2.9%, respectively. Mindful of this reality and to plug the existing gaps in our health system, the government announced a new flagship scheme called the Ayushman Bharat in the Union Budget of 2018-19. 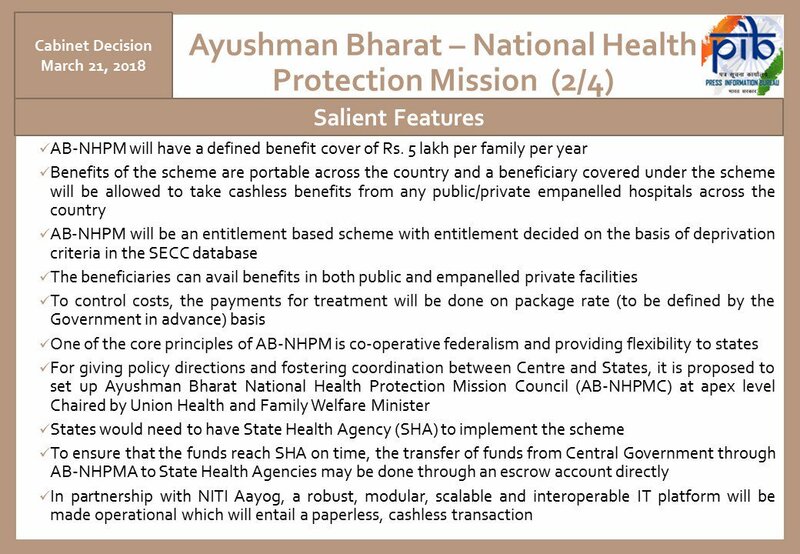 One component of the scheme—the National Health Protection Mission (NHPM)—was to provide a financial cover of up to `5 lakh per family per annum to enable them increased access to secondary and tertiary healthcare, for the poor and lower middle class families, in a facility of their choice, irrespective of whether the ownership is public or private. As an initial measure, the plan is to cover 10.74 crore families, or about 50 crore individuals (roughly 40% of the total population), at the bottom of the pyramid as identified through a comprehensive Socio-Economic Caste Census (SECC) database. The other component is to build a next-generation primary healthcare system, which would be publicly provided at locations close to the community. It sought to expand the reach and broaden the scope of our primary, preventive and promotive care through a network of 1.5 lakh Health & Wellness Centres (HWCs). It envisages population-level screening to detect diseases early and initiate timely treatment—which is especially critical in the context of India’s rising NCD burden. As an added measure, provision of free drug and diagnostics at these HWCs was expected to take care of that part of the OOP expenses borne by our poorest citizens for accessing outpatient care. The first of such HWCs has already been launched in the Bijapur district of Chhattisgarh, by the Prime Minister on April 14, and as we write this, work is going on in hundreds of others in the 117 ‘aspirational districts’ to provide meaningful and comprehensive primary care to our citizens. When the Ayushman Bharat was announced, critics argued that the scheme has been insufficiently imagined, that there was a lack of preparation, that it was not backed by adequate budgetary resources, and that the government lacked the techno-managerial wherewithal for its implementation. The Prime Minister, during his Independence Day address, gave a befitting response to the scepticism and to the naysayers by announcing the soft launch of NHPM, christened the Pradhan Mantri Jan Arogya Abhiyan. This clarion call from the ramparts of the Red Fort is a clear indication that the teams at the National Health Agency (NHA) and the ministry of health & family welfare (MoHFW) have been able to successfully surmount the significant challenges in terms of creating an IT backbone, cleaning up the beneficiary database, setting in place the guidelines and procedures, negotiating with state governments, while simultaneously building capacities for its implementation. The fact that all this has been achieved in a relatively short span of just six months is a glowing testimony to the hard work and speedy execution by Indu Bhushan and his team at the NHA. In addition, as many as 28 state governments have signed a memorandum of understanding with the NHA to implement NHPM, and are in the final stages of preparation for a formal launch. Over 8,000 hospitals have offered to join the network of empanelled facilities that would provide inpatient care to the identified beneficiaries. To ensure that no one is left out, there is no cap on family size or age. Similarly, there can be no exclusion on account of pre-existing disease conditions, among those who are eligible for benefits from day one of the roll-out of the scheme. As many as 1,350 medical packages—covering surgery, medical and daycare treatments—have been identified so that the coverage includes most of the common medical conditions. The software application driving the scheme is designed in such a way that an individual can avail of the benefits anywhere in the country irrespective of her place of origin, and it is cashless for the beneficiary and the claim settlement is paperless for the hospitals participating in the scheme. The NITI Aayog’s Three-Year Action Agenda highlights the need for creating a wave of new institutions to build a 21st century health system that every citizen of the country would be proud of. Setting up of HWCs and the NHA are steps in the right direction, which were long overdue. The government’s active stewardship in leveraging the potential of the mixed health system is a very welcome development. It is all the more heartening to note the political commitment at the highest levels to transform India’s health system into an affordable, accessible, inclusive and efficient system. The Ayushman Bharat has the potential to protect millions who are pushed into poverty every year due to catastrophic health expenses. Building a well-functioning health system is a work of decades—it took Germany, for example, 127 years to accomplish universal coverage. Thailand undertook reforms over a period of 30 years prior to announcing its universal health policy in 2002. Now that we have unprecedented political backing for the Pradhan Mantri Jan Arogya Abhiyan, the stage is set for its execution. Needless to say, in a country as large and complex as India, we will be faced with many implementation challenges. It is well worth recounting the Bhagavad Gita dictum of “Yogah Karmasu Kaushalam” (the path to redemption/salvation lies in the skilful execution of the job at hand). Thus, it is imperative we stay the course and pursue these ambitious initiatives with utmost vigour and determination. Alok Kumar is Advisor and Vinod Paul is Member (Health), NITI Aayog.